An important pilgrim centre of all faiths, Assam is known for its unique architecture in the backdrop of natural scenery which makes visiting these places an interesting experience. Located in the south-eastern part of Himalayas the temples in the state have gods and goddesses that are the favourite deities of many people in the north-eastern region of the country. Dedicated to Lord Vishnu, this temple in Guwahati is an important Vaishanvite shrine. Situated on a rocky stratum close to waterfront of Brahmaputra, the temple is considered a sacred one, according to Yogini tantra. It is believed that a sinner can achieve salvation by offering worship here. The deity is referred to as Anantasayin Vishnu. According to legend, Lord Sri Krishna camped with his army here before he killed the demon King Narakasura. The temple is famous for its scenic beauty and dexterous carvings including one that of a reclining idol of Lord Vishnu. 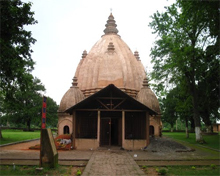 This Devi temple is situated at Gaurisagar in Sivasagar (or Sibsagar) district. Goddess Durga is worshipped here and Shakti puja is celebrated for the past 300 years. Durga Puja is observed with fanfare and rituals twice a year inthis temple in the month of Ashwin (Sep-Oct) and Chaitra (Apr-May). In this temple the sikhara is without the familiar amalaka in thestandard pattern; instead, a tier of gold-plated kalasas in tapering sizes is placed on a solid circular base made of bricks. On the exterior walls of the temple there are bands of sculptural panels. 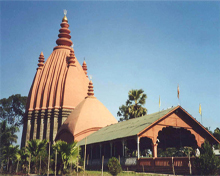 This temple is located atop the Madanachala hill in Hajo, about 32 km north-west of Guwahati in Kamrup district. Lord Shiva is the presiding deity more popular as Kedareswara or Kedara. The inscriptions on the temple show that it is built by KingRajeswar Singha. 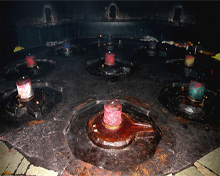 Lord Shiva is worshipped in the form of linga, which is called Sayambhu Linga. It has a big linga made of stone as the main sanctum. Lord Krishna is the presiding deity of the temple at Rajaduararea of North Guwahati. Having a strict timing, Doul Govinda temple is popular for Holi celebrations in February-March. There are a lot of legendary stories surrounding this temple. It is said that Ganga Ram Barua brought the idol from Sandhyasar, a remote place near Nalbari. And it was renamed as Doul Govinda about 150 years ago and it was again renovated in 1966. Also known as the abode of Lord Surya (Sun God), the temple perched on top of Citrasaala hill in south-east Guwahati is dedicated to nine planets of the solar system that influence life on Earth. Lord Shiva is worshipped in the form of nine shivlings that represent the nine planetary gods of Hinduism. The nine lingams are wrapped in coloured clothes, each of these fabrics symbolises one of the nine planets. King Rajeswar Singh built the temple in late 18th century and this eloquent structure is an important astrological centre in the state. 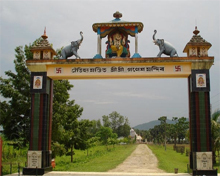 Located in Tezpur in Sonitpur district, the temple has a backdrop of green valleys and snowy peaks of Himalayas. Dab Parbatia is one of the finest examples of sculptural and iconoclastic art forms in Assam. The carvings of Da-Parbatia display a style reminiscent of early Gupta school of architecture. The temple doorjambs are adorned with the forms of GoddessesGanga and Yamuna standing with garlands in their hands. Also, the whole doorframe is ornamented with beautiful and delicate foliage. The entire place is being protected by theArchaeological Survey of India. Located on the banks of Sibsagar tank, the temple stands on a four-and-half-acre space and belongs to the dvaikuta class. It has two cells -- a garbagriha and a mandapa. Above the sanctum there is sikhara with fluted vertical lines. Its replicas called Uramanjari surround the main tower. There are two more temples dedicated to Lord Vishnu and Goddess Devi in the same tank. On top of Bageswari hill in the centre of Bongaigaon town, the spot, according to legend, is where Goddess Durga's trishul fell down as her body was cut into two pieces by Lord Vishnu after Dakshya Yagya. The hill is a natural watch tower for the entire town and its nearby areas. Besides, the hill also houses an ancient Shiva temple inside a stone cave and Baba Taraknath Temple. 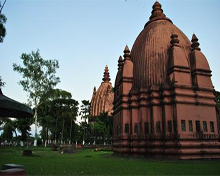 One of the historical sites, the temple is located 25 km from Bongaigaon district. 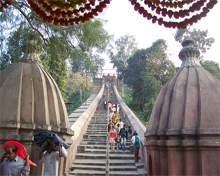 The temple lies on the Khagrapar Hill near Abhayapuri town under North Salmara sub-division. It is believed that an earthquake during the 8-10th centuries destroyed the temple and its images. 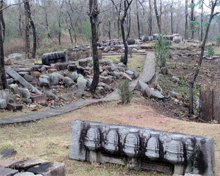 The existence of ruins in temple area along with idols and images was brought to the notice of the Historical and Antiquarian department of the state government in 1974. During the excavation, temples, idols and sculptures were discovered by the government team. Lord Shiva is the main deity of the temple located on Itakhuli hill on the south banks of river Brahmaputra near Guwahati. With a history dating back to 18th century, the temple is said to have the largest Shiva lingam or phallic emblem in India. The hillock where the temple is situated is called Hasti which was mentioned in the Kalika Purana, and described as the ashrama (hermitage) of the sage Sukra. King Pramatta Singh of Ahom dynasty built the Sukreshwara temple in 1744 CE. Present atop a hillock in Tezpur, the temple is a big landmark and has Lord Shiva as its presiding deity. The demon king Banasura introduced the linga worship at his capital Tezpur. Moreover, it has the world's largest stone phallus (Shiva Linga) which is said to have been created by Banasura. Originally built of stone, the temple suffered extensive damage in the earthquake of 1897. Renovation is underway with concrete support for the Shiva Linga. Shivaratri is celebrated in a grand manner attracting people from across the country. One of the biggest Shakti temples in India and is an important pilgrim centre for Hindus. 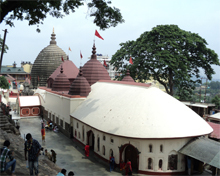 Located high on the Kamagiri or Neelachal hill in Guwahati, the presiding deity is called Kamakhya Devi. Durga Puja is celebrated during Navaratri that occurs between September and October and the temple becomes an active for devotees from all over the country. According to legend, Lord Shiva created this temple on thePeacock Island in the middle of river Brahmaputra to keep His wife Uma happy. Lord Shiva is said to have lived here in the form of Bhayananda.Hence, the temple got it name Umananda. Constructed in 1664 CE, Siva Chaturdasi is a gala festival held annually in this temple. The shrine in Guwahati is dedicated to Lord Kamdev and is also known as the Khajuraho of Assam. Built during 10-12th century in the Pal dynasty, the temple is surrounded by sal and teak forest over a hillock. The hill ruins of another temple are also located on a knoll called Jalpeswar on the western end of the Madan Kamdev hill. To its north on top of the "Narasimha' hill rock are also to be found a few architectural remains. An old temple at Golpada near Guwahati, the temple is located on a peak called Pahar. A circular stone tablet has 12 images of Lord Surya with an image of Kashyapa, his father at the centre. Surya is said to be the son of Aditi and Kashyapa. It is believed that Vyasa engraved the 99999 Shiva Lingas here to build this place as a second Kashi. Surya Pahar temple is very attractive and gives a panoramicview of Assam's beauty. Located on the banks of "Borpukhuri" (big tank) in Sivasagar town in Guwahati. It is one of the tallest Shiva temples in the world. Shiva temple is 180 feet tall and 195 feet in diameter. It is caped with seven feet high large golden dome, called ‘Kolosi’, on the topmost part of the dole. 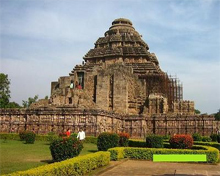 Siva temple lies between two smaller temples -- Devi-doul and Vishnu-doul (doul-temple). The temple was constructed by the Ahom kings. Maha Shivaratri is celebrated with fervour and pujas during which time thousands of devotees come to have darshan of the Lord. Another major draw is 'Hare Krishna' bhajans in the month of 'Shawan'. 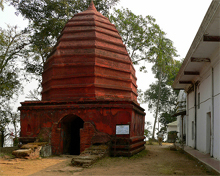 Dating back to 18th century, the temple in Kamarupa district was built by King Shiva Singh of Ahom dynasty in 1725. Ugratara is one of the important Shaktipeeth at the heart of Guwahati. 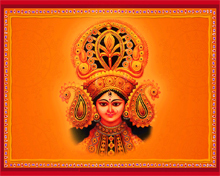 The main festival is Navaratri as devotees from far and wide come to offer their prayers and seek blessings of Maa Shakti. An important ritual observed is the sacrifice of animals like bulls, buffaloes, wild boars and goats. Situated on Monikut hill near Hajo of Kamrup district, the maindeity is Lord Hayagriva who is one of the incarnations of Lord Vishnu. King Raghu Deva Narayan of Pala dynasty built the temple in 1583CE. It is a stone temple and enshrines an image of Hayagriva Madhav. The rows of elephants are seen on the body of the temple and they are fine specimens of Assamese art. A big pond called Madhab Pukhuri is a major attraction near the temple. The Bihu and Janmastami festivals are celebrated in the Hayagriva temple. 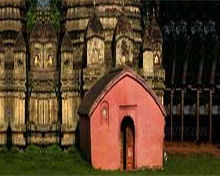 One of the oldest temples at Sadiya in North Lakimpur district is dedicated to Goddess Tamresvari Devi. But at present it is in a ruined state with thick jungle around it about 7 miles from Sadiya. It is a small stone enclosure without cement as the stones are joined by iron pins without clamps. The roof was made of copper, but it has fallen in. The interior is eight feet square. The whole structure is enclosed within a brick wall 130 feet by 200 feet. 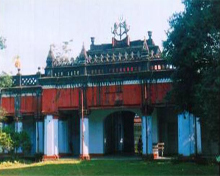 King Pramatta Singh built this Shakti temple at Silghat (Nagaon district) in 17th century. 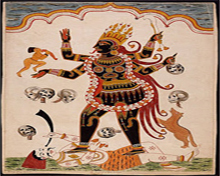 The main goddess is Mahisamardini (Durga) who stomps her right foot on the lion and pressing the shoulder of a buffalo demon with her left foot. Her trident pierces the demon's body and his arms are tied with a noose. The goddess has a slender waist, ten hands holding different weapons and broad breasts. A Shiva temple in Dergaon, this temple is on a hillock in Golaghat district near the Brahmaputra river. King Swargadeu Rajeswar Singha built the temple in 1687. 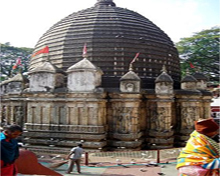 The main temple is surrounded by four other temples -- Bishnu, Ganesh, Surjya and Durga temples. It is said that a rishi named Urba wanted to create a second Kashi at this spot for which he collected many Shiva lingas. Once the habitat of a bird known as Negheri, this temple hence got its present name Negheriting. Majuli, the world's largest river island, has many centres (satras) of Vaishnavism established by Sankardeva, a religious leader. 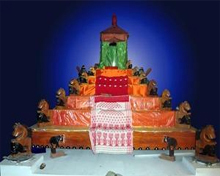 During Rasotsava festival, the Vaishnavites throng these satras in Majuli island constructed in 15th century. At present, there are 65 satras are in Assam that propagate Vaishnavism. Out of 65 satras, 22 are in Majuli. The satras have becomecentres of education and dissemination of all kinds of art of harmonious living. The satra culture was quite vibrant in Majuli, Bardowa, Barpeta and Madhupur.